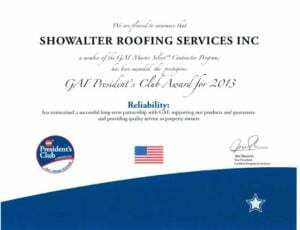 Showalter Roofing Service, Inc., of Naperville, Illinois, has received GAF’s most prestigious contractor award: The GAF President’s Club Award. 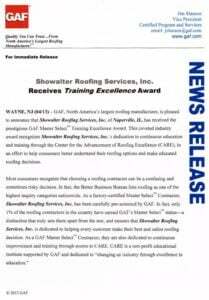 This highly coveted award recognizes Showalter Roofing Service as one of the “elite of the elite” among commercial roofing contractors in the United States. 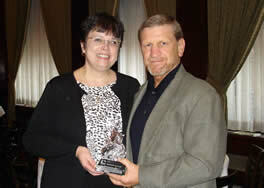 2012 Angie’s List Super Saver Award. We are proud to be in the top 5% out of over 29,000 companies on AngiesList.com! The DaVinci Masterpiece Contractor Program is for select contractors, to recognize their loyalty by providing a tiered level of support. 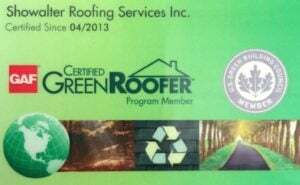 Showalter Roofing Service, Inc. has pledged to use at least 5% more made-in-America products, thereby helping to create American jobs. The All-American Home 5% Pledge. 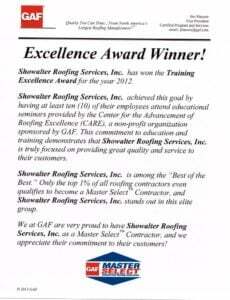 For the past couple of years, Showalter Roofing has been participating in key competitions for excellence in roofing. In our over 25 year history, we have never submitted our name for consideration. We came to the conclusion that by participating in excellence awards, it was a valued and valid way to show people that our services are all that we say that are. We hope these prove our point. Showalter Roofing today announced Paul Showalter’s successful completion of the NRCA’s three year leadership program offered by the Future Executives Institute (FEI) focusing on business and personal development. The 30 graduates are taught by Northwestern University professors, respected industry leaders and field experts passing on vital knowledge that works to bring the roofing industry forward. 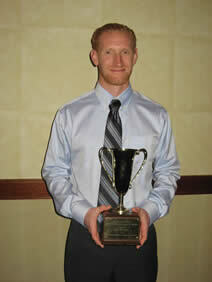 Showalter Roofing’s Commercial Roof Department manager graduates from the prestigious NRCA, National Roofing Contractors Association 2011 Future Executives Institute (FEI). 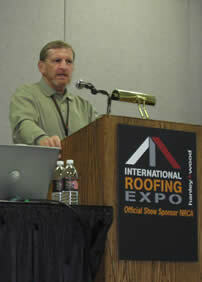 The three year program is designed to develop future roofing manager into the industry’s leaders of tomorrow. Since 1977, Showalter Roofing has grown to become a leading roofing contractor for residential and commercial roofing systems. The Company follows its core principals and it is reinforced by feedback from customers to OSHA certified safety training and more.